Our vessels, Elizabeth G and Emma Jane sail from Oban at 4pm on the day of departure. Guests are provided with with detailed joining instructions prior to their cruise. 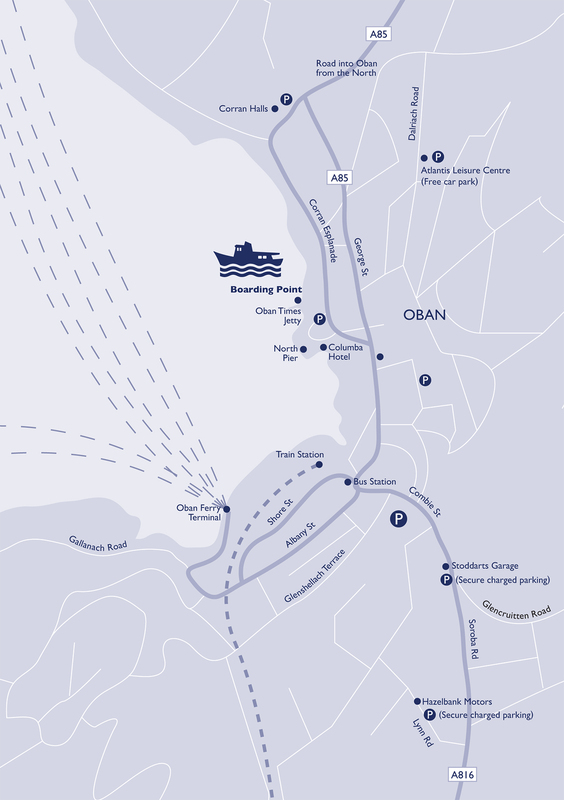 Click here to view a map of Oban showing parking and boarding places. The majority of cruises depart on a Saturday but some of the longer cruises depart on a Sunday or Monday. Your vessel generally disembarks on the last day of the cruise around late morning (10am-11am). By car: If travelling from the south, Oban is a 2.5 hours drive from Glasgow. There is secure paid parking in Oban. By air: From Glasgow airport, take the airport bus into Glasgow City Centre to catch the train to Oban. By train: There is a very scenic 3-hour train journey between Glasgow and Oban departing frequently throughout the day. By bus: There is a regular bus route from Buchanan Street Bus Station in Glasgow to Oban which takes 3-hours. Please get in touch if you need more detailed advice and information on the travel arrangements to meet your cruise, we are happy to help. We really enjoyed our cruise and were made to feel very welcome on board by a very friendly and knowledgeable crew. The scenery was fantastic, and we enjoyed exploring the islands on foot with our great wildlife guide Lynsey. The anchorages and route were carefully planned by Rob the skipper to take account of the weather and wildlife reports. We were fortunate to see large numbers of dolphins, a few Minke whales, seals and white-tailed eagles, together with countless seabirds. The food was plentiful and absolutely delicious, prepared by Tony, the chef - it was just as well we went walking every day! Craig the bosun was extremely helpful and nothing was too much trouble for any of the crew. There was a good library of books on board. I would certainly recommend Hebrides cruises to anyone who is interested in wildlife, walking, and good food!